The prior written notice form was issued in January 2010, as a model State-developed form. 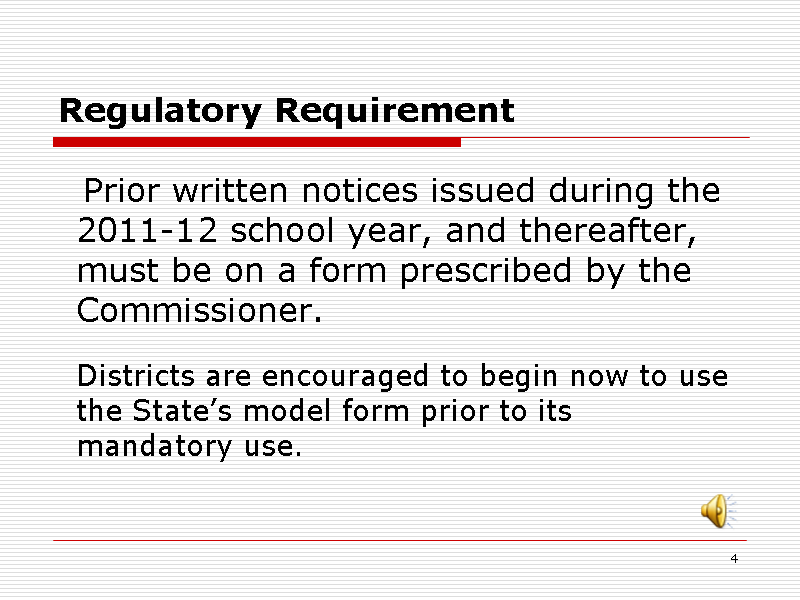 Districts may, but are not required to use the State’s model form at this time. However, all prior written notices issued during the 2011-12 school year, which begins July 1, 2011, and thereafter must be on the form prescribed by the Commissioner of Education. The prior written notice form may be used in its current Word format, or it may be converted to another format, including a computerized format. However, it is important that both parents and districts understand that, once the State form is required for use, the form itself may not be modified to change its appearance or standardized content. School districts are encouraged to begin to use the form now.